Chuck LaRocque, President-The Rotary Club of Brandon #1344 with the help of Cindy Buizer, Exec. Director Brandon Regional Health Centre Foundation (BRHCF) places a plaque of thanks and recognition on the 5th floor of Brandon Regional Health Centre to acknowledge The Rotary Club of Brandon #1344 contribution of $50,000 to the BRHCF’s “Room for Renewal” project. 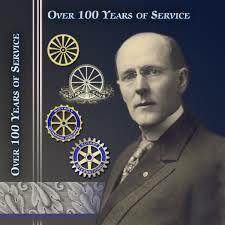 Rotary is always seeking opportunities to support community service. 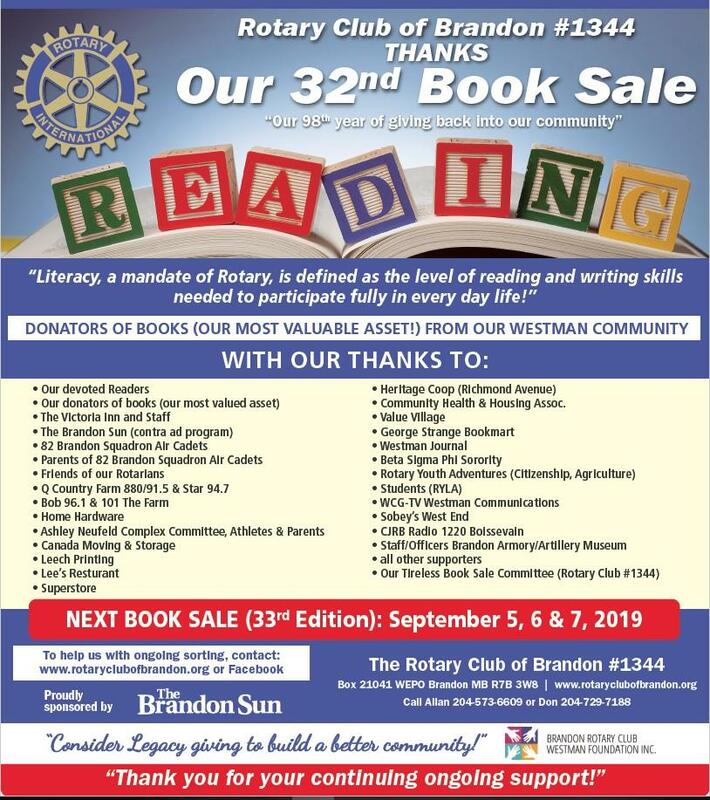 The Brandon Regional Health Centre will touch almost every family in Westman at some time and The Rotary Club of Brandon is proud to have supported the “Room for Renewal” campaign, once again showing their commitment to our community! Applications are now being accepted for our youth leadership program - Adventure in Citizenship. Please contact our Youth Coordinator for more information and an application form. 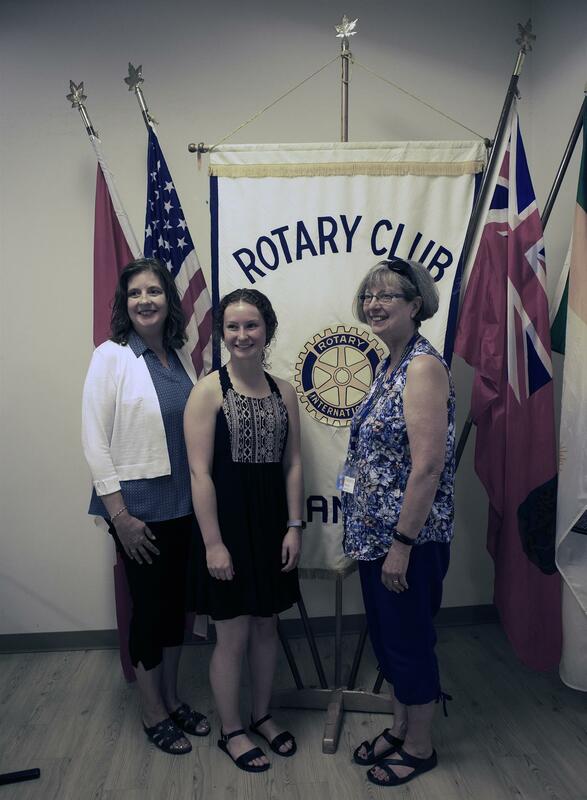 Our 2018 Adventures in Citizenship student Kayla Burt gave us a presentation of her trip to Ottawa at our July 10 lunch meeting. Kayla joined 199 other High School students in Ottawa to learn about Canada's parliamentary democracy and its institutions. The visit included tours of Parliament, the Senate, the Museum of History, Wabano Centre for Aboriginal Health, and the Library Archives of Canada. They witnessed a Canadian Citizenship Ceremony on July 1, and were able to reaffirm their citizenship. The real eye-opener for Kayla was when she participated in an Aboriginal blanket exercise. Kayla thanked the Rotary Club of Brandon for giving the her this amazing opportunity. Our 1983 Rotary Exchange Student Returns! At our June 26 lunch-time meeting, we were delighted to be visited by our former Rotary Exchange student - Joao (John) Lopez and his family. John was a 16 year old exchange student from Brazil who was hosted by The Rotary Club of Brandon in 1983-84 when club president was Ed Jarvis (later District Governor). John attended Vincent Massey High School. John made many lasting friends and has carried on a very long lasting communication with Will & Jane (Harding) Lamont. In fact, their friendship is a large part of John and his family’s visit back to Brandon. John decided to bring his family to Brandon and show them where he spent a year learning English, Canadian culture, and making life-long friends. Pam (pictured below) and Jack Stacey were one of John's host families in 1983. John told us that even after 35 years, he still gets emotional when describing his experience to his children. (front row L - R): John A Lopez. and John F Lopez. * Pam Stacy hosted John, acting as his host "Mom", for a few months during his stay with us in 1983. 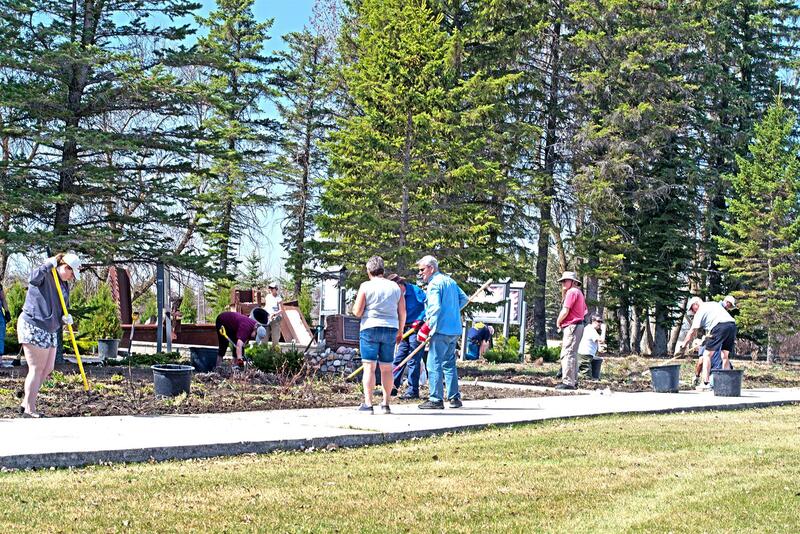 On Sunday, May 6 members from the Brandon and Minot Rotary Clubs met at the International Peace Garden for a morning of gardening at the 9/11 Memorial Site. The 9/11 Memorial Site was created in May 2002 in memory of those who lost their lives in the events of September 11, 2001. Ten pieces of steel from the wreckage of the World Trade Center form the centrepiece of the memorial. Brandon Club members were Cheryl & Roger Winger, Bernie Chrisp, Marty & Elaine Snelling, Michelle Fortin, Bill Anderson, Pam Stacey, Jane & Norm Neil, Rick Felstead, Chuck LaRocque, Ron Adams, and daughters Hannah & Carsyn. From the Minot Club were Kevin Harman, C. J. Craven, and two others (names not recorded). 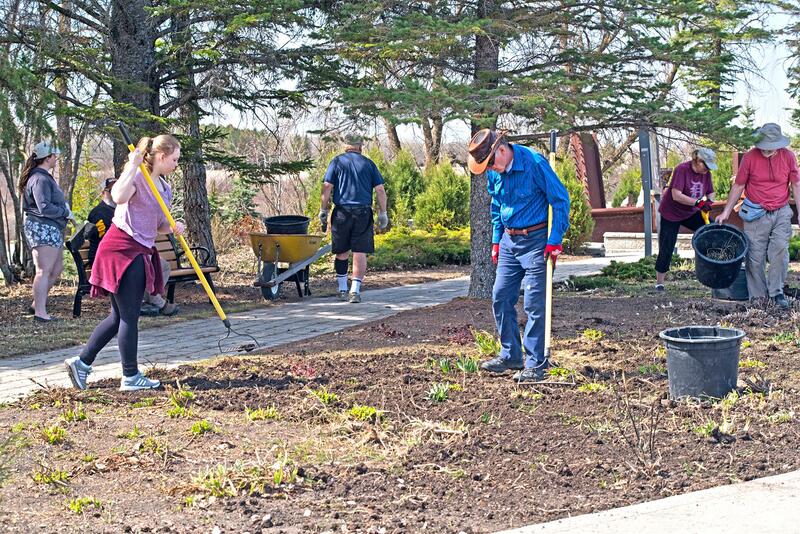 Also participating were International Peace Garden staff Tim Chapman, CEO and Connie Lagerquist, Horticulturist. Getting the soil ready for new flowers (L-R: Hannah Adams, Ron Adams, Carsyn Adams, Bernie Chrisp, Bill Anderson, Elaine Snelling, Roger Winger). Connie Lagerquist (blue jean shorts, back to camera) discusses strategy with Peace Garden Board member and Rotarian Rick Felstead. The Rotary Club of Brandon was fortunate to have two guest speakers this week, Gabrielle Ramos from Brazil, an exchange student who will stay with three Rotary host families. She spoke very well about her opportunities to come to Canada and offered some facts about Brazil, her pride in her home country, and the differences between Canada and Brazil. Expect to see this young lady becoming a strong advocate for youth and international cooperation in the years to come. Her host family also has participated in the Rotary Youth Exchange program albeit 15 years ago. Nathan Peto, presently the Manager of Corporate Initiatives for the City of Brandon. The contrast (and similarities) between the two participants was remarkable. Nathan had gone to South Africa in 2001 and he stressed how important the trip was for his development into a young man. His parents talk about Nathan before and after the trip and the profound impact it had on his outlook on life. When he returned, he was more confident, independent, goal driven, focused and worldly. He felt he became a better global citizen, and a better leader. He became acquainted with Rotary, first through RYLA (Rotary Youth Leadership Awards), a four day camp which has had only highly positive feedback from the participants, leaders and even those responsible for transport to the camp. From that he went to the Exchange Student program. Only two weeks after his graduation from Vincent Massey high school, he was on the plane heading for South Africa. As much as he thought he was independent (worked, saved for his own car, fought my own battles) you’ll never be as independent from your parents and friends when you step off that plane. You have to learn to communicate effectively (English/but many are not), you have to have a voice (cant be passive) you have to network and make connections. Your exchange is what you make of it….take ever opportunity you can… saying Yes to learning opportunities – he helped with Durban sharks (releasing them from safety nets), bungee jumping, playing Cricket and Rugby or learning about sewage treatment facilities. You have to think for yourself with no safety net. You had to be your own person! At 17 I had to make decisions for myself that I frankly don’t see some 23 year olds making in a world of helicopter parenting. it was empowering as a young person. And had a profound impact on my development. Our thanks to both of these remarkable individuals and we are pleased to have gotten the opportunity to hear them speak. Don Partrick, Chairman, Public Relations (Communications), spent several hours recently in the Main Concourse of the Keystone Centre sprucing up the club’s display cases. 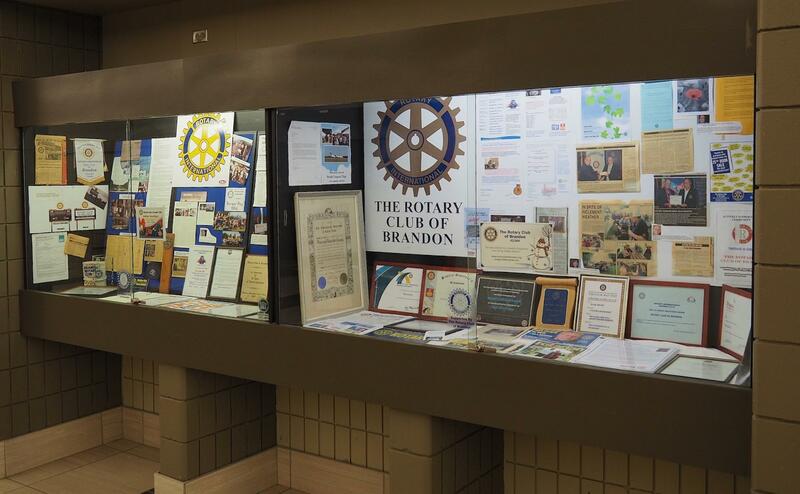 The cases, gratefully provided to the club by the Keystone Centre, now offer the public updated information about our club and its ongoing activities in Brandon and Westman.The display also contains some of the club’s cherished artifacts, such as our original Charter, signed in 1921. Any questions or comments are welcome, Don notes. 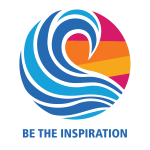 Ripple Effect is a Rotary District 5550 program through which Rotarians and other organizations and individuals in Canada can reach out to countries where children’s education is at risk. The program works in partnership with Rotary Clubs and communities in Guatemala to help build, equip and support schools for children in grades K to 6. 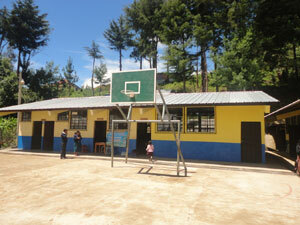 Your donation to the Ripple Effect Program will help build and/or equip a school in Guatemala. The Rotary Club of Brandon, along with other Rotary Clubs in Ontario and the Prairies have worked together to build a school in San Miguelito, to help reduce the incidence of illiteracy and poverty among the people of the area. Guatemala is not only one of the poorest countries, (Guatemala is geographically south of Mexico), but has the lowest literacy rate in Central America. The school has taken several years to build, with all work done by local people and supervised over all by local and Canadian Rotary clubs. Presently there are 5 classrooms, a computer lab, kitchen, washrooms, principal's office, storage along with a cemented playground, fencing and retaining walls. Needless to say, the school has become the meeting place of the town with a market and place for sports and recreation. 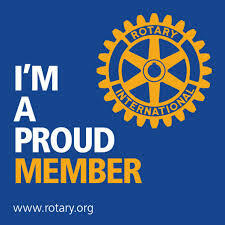 Our club meets every Tuesday at the Meeting Room at Rotary Villas. You can purchase a full lunch, or something lighter. There is fellowship before the meeting is called to order. Then club business is attended to. Following that, there is a guest speaker from the community. There is also a 50/50 draw. There are greeters at the door to help out anyone visiting the club. Sally & Peter Dell, visiting Rotarians from Australia, dropped by to say "G'Day Mate!". The Shelterbox program is an unbelievable program to give the opportunity to an individual or a group to be able to step up and give a huge amount of help to people in need. For example, the Shelterbox provides sustained shelter for people dealing with disaster in the Philippines. Shelterbox already has two response teams on the ground in the Philippines who are working with the help of Rotarians to provide emergency shelter and lifesaving supplies in the aftermath of Super Typhoon Haiyan. 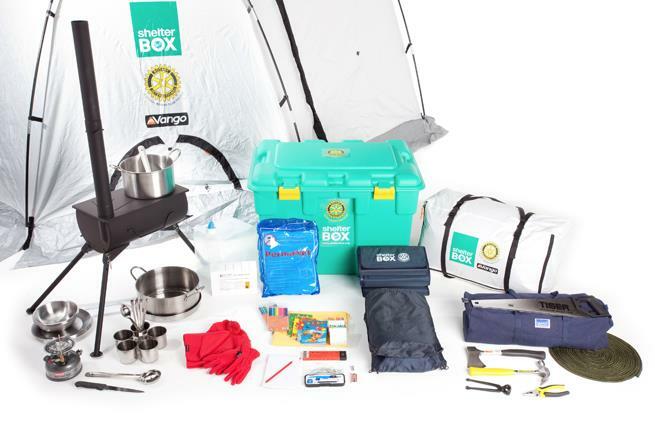 The total cost of a Shelterbox is $1,500, but you can contribute a portion which can be gathered together with other donations to make up enough to purchase a Shelterbox. Some 90 countries have received Shelterboxes. 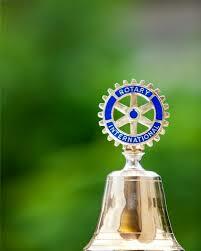 And more than 130,000 Shelterboxes have been deployed since the Rotary Club project since 2000.